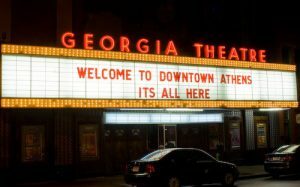 The people of Athens, Georgia are invariably divided as to exactly what it was that put their town on the map. Some say it was The University of Georgia, the state’s flagship institution of higher learning and the first land-grant university in the nation, founded as the smoke of the American Revolution was still clearing. Some say it was football, as the University’s team, the Bulldogs, has spawned some of the sport’s brightest lights and fans whose devotion and enthusiasm run at a level usually reserved for pagan deities. 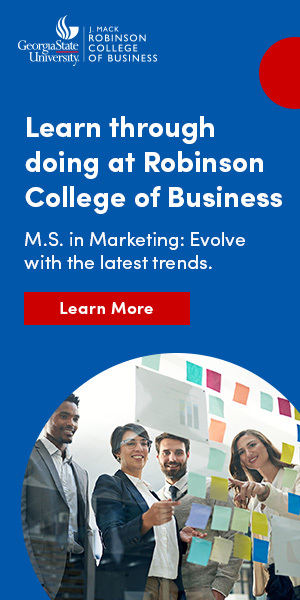 And then there are those others… the ones who claim that Athens’ transformation from sleepy hick college town to globally recognized mecca of cool was not slow evolution but the result of a single cataclysmic event. The date of this Big Bang: February 14, 1977 — the Valentine’s night that five hipster kids, dressed in funky thrift-store drag and banging inexpertly on bongos and a toy piano, played their first party under the name The B-52’s. The usual witticism in the independent rock press was that there must have been something in the water of Athens that produced all the music suddenly coming out of this little town. Bands like The B-52’s, The Tone Tones, Pylon, The Method Actors, The Side Effects — quirky, iconoclastic, different in sound from each other but collectively a far cry from the Southern boogie-bands that were the South’s stock-in-trade. In the wake of the international acclaim lavished upon Athens music’s pioneering first wave came a second wave of news-making bands with names like Dreams So Real and Widespread Panic. As the millennium turned, Athens became a hub for a renaissance of the jangly power-pop genre through the formation of Kindercore Records. And, lest we forget, for every solo artist or band to land a record deal there are a hundred young and not-so-young bands playing hard and loud and strong, a nightly eruption of music that rises and hangs there in the sultry Southern air. This exhibit is a celebration of one of the strangest musical phenomena in the history of rock and roll. From its beginnings as a collection of bored and alienated party-punks, colliding and groping and sweating their way through hazy Georgia summer nights under a single light bulb and improvising as they went along, to the present, where music can be heard from every other doorway on every downtown street, every night in Athens, the proud hometown of some of the hardest-working rock bands on the planet. Future B-52’s Fred Schneider, Ricky Wilson, and Keith Strickland play a poetry reading as Nightsoil. October: Over dinner at a Chinese restaurant, Schneider, Strickland, Wilson and sister Cindy, and Kate Pierson decide to form an as-yet-unnamed band. February: The B-52’s play their first public gig, a Valentine’s Day party. Their combination of retro-kitsch style, outrageous stage presence, and danceable hooks is a wake-up call in those days when Southern boogie was the dominant party music. The local buzz surrounding their performance draws the nucleus of “the Athens music scene” and it is generally agreed upon that this is the beginning of the phenomenon. December: The B-52’s play Max’s Kansas City in New York, thus introducing Athens to the independent/punk/New Wave scene at large. January: The B-52’s close the First Atlanta Punk Festival. The general consensus is that no one could have possibly followed them..
May: The B-52’s release their first single, “Rock Lobster/52 Girls,” on DB Recs. The Tone Tones play their first public gig, opening for The B-52’s at the Georgia Theatre. October: Curtis Crowe and Bill Tabor hold a Halloween party in a space they jokingly call “The 40 Watt Club,” after the single light bulb providing illumination for the party. March: Pylon play their first public gig, opening for The Tone Tones at a party. Their precise and tight musicianship and singer Vanessa Briscoe’s stage presence make them a fixture of the Athens party scene. April: The B-52’s relocate to New York. Deep scholarly debates as to whether the band should be considered “an Athens band” continue to this day. May: Future R.E.M. drummer Bill Berry appears as drummer for the WUOGerz, a garage band made up of employees of the UGA campus radio station. The first annual Human Rights Festival is held downtown. It will become a rite of spring for College Square to give way to alternating soapbox orators and local bands for the weekend. July: The B-52’s release their self-titled first album on Reprise Records. October: Vic Varney and David Gamble of the now-defunct Tone Tones debut as The Method Actors, opening for Pylon at Tyrone’s. The B-52’s release Wild Planet. January: The University of Georgia Bulldogs, behind superstar running back Herschel Walker, win the NCAA football championship, contributing to a surge in enrollment at UGA. Pylon releases first single, “Cool/Dub,” on DB Recs. February: Future R.E.M. members Michael Stipe, Peter Buck, Mike Mills, and Bill Berry play their first jam session as a group. April: The Side Effects, Turtle Bay, and the as-yet-unnamed R.E.M. play a party at the abandoned church where Stipe, Buck, and hostess Kathleen O’Brien live. R.E.M. name themselves for their second gig. They quickly establish themselves as an energetic and dynamic outfit, rock stars in the making. May: Paul Scales and Steve Allen officially open The 40 Watt Club as a nightclub (though originally called The 40 Watt Club East), devoted entirely to local bands in “the scene.” The Side Effects are the first band to showcase there. June: R.E.M. play their first gig in Atlanta. July: R.E.M. play their first out-of-state shows, in North Carolina. August: The Side Effects and Love Tractor play New York. October: Pylon release their first album, Gyrate, on DB Recs. The B-52’s release Party Mix!, an EP of dance remixes of songs from their first two albums. Guadalcanal Diary form in Marietta, Georgia. Like Decatur’s Indigo Girls and North Carolina’s Let’s Active and Flat Duo Jets, they will be constantly included in the roster of “Athens bands,” and drummer John Poe and guitarist Jeff Walls will be involved, respectively, in Love Tractor and Athens rockabilly heroes Hillbilly Frankenstein. July: R.E.M. release their first single, “Radio Free Europe/Sitting Still,” on Hib-Tone Records. Critics rave over the combination of Stipe’s abstract lyricism and obscurist vocals and Buck, Mills, and Berry’s muscular playing. That combination would be R.E.M.’s signature style for years, causing them to stand out from their New Wave contemporaries. Oh-OK debuts at The Night Gallery. The B-52’s release an EP of new material, Mesopotamia, with David Byrne of Talking Heads producing. The record is not well-received by critics, and it comes to be the band’s least favorite record. Pylon release their second album, Chomp. January: Tyrone’s, the first Athens nightclub to showcase local bands, burns down. The Method Actors release a critically acclaimed double album, Little Figures, but find the dwindling crowds at their hometown live shows disheartening. They disband later in the year, moving on to solo endeavors. February: Love Tractor release their eponymous first album on DB Recs. May: R.E.M. signs a record deal with maverick independent label I.R.S. Records. August: R.E.M. release their first EP, Chronic Town, on I.R.S. Records. They begin to tour nationally. The B-52’s release their third full-length album, Whammy! Love Tractor release their second album, Around the Bend. January: People magazine reports on the “Athens music scene,” the first major mainstream publication to do so. Locals regard this as the beginning of the end of the Athens rock-and-roll Renaissance. Musicians begin moving to town in droves to take advantage of Athens’ high profile. April: R.E.M. release their first full-length album, Murmur, to unheard-of critical acclaim. Fred Schneider and the Shake Society, a side project, release an eponymous album, which contains the single “Monster,” an underground party classic. Love Tractor release Wheels of Pleasure. Guadalcanal Diary release their first album, Walking in the Shadow of the Big Man, on DB Recs. Dreams So Real form with a mission to distance themselves from “the Athens sound,” one of the first of many bands who will usher in a “second wave” of local music. February: The first “Athens music movie,” a video of Pylon’s final performance called “The Athens Show,” premieres at The Mad Hatter. Buzz of Delight, featuring future alt-rock hero Matthew Sweet, opens for the film. Dreams So Real release their first single, “Everywhere Girl/Whirl” on Coyote/Twin Tone Records and becomes the indie label’s biggest-selling single. Widespread Panic form out of a weekly jam session at the Uptown Lounge. They will become the foremost band of the “second wave” of Athens music and a harbinger of the changing dynamic of the scene — the divide between UGA students and “townies” has begun to crumble and Widespread Panic’s blend of straight-ahead rock and psychedelic boogie proves to have tremendous crossover appeal. June: R.E.M. release Fables of the Reconstruction, which goes on to be named Album of the Year by College Media Journal. October: B-52’s guitarist Ricky Wilson dies from an AIDS-related illness. The effect on both the band and the old-guard Athens scene is devastating. The B-52’s release Bouncing Off the Satellites, recorded before Ricky Wilson’s death. Guadalcanal Diary release major-label debut, Jamboree, on Elektra Records. Dreams So Real release their first album, Father’s House, to critical acclaim. July: R.E.M. release Lifes Rich Pageant, named after a line from a Peter Sellers film. The album and its single, “Fall on Me,” begin to garner mainstream media attention and airplay. Love Tractor release This Ain’t No Outer Space Ship. Widespread Panic release their first album on Macon’s Capricorn Records, the legendary label of The Allman Brothers and other giants of the Southern-boogie genre. October: R.E.M. release Eponymous, a “greatest hits” album that fulfills their record contract with I.R.S. Records and allows them to sign a multimillion-dollar deal with Warner Bros.
November: R.E.M. release their major-label debut, Green, featuring the Top-10 party anthem “Stand.” In Green’s wake R.E.M. is named “America’s Best Rock and Roll Band” by Rolling Stone. Love Tractor release Themes from Venus. Guadalcanal Diary release Flip Flop. After touring in support of the album, the group disbands, playing their farewell show at UGA’s Legion Field. Cindy Wilson leaves the B-52’s. Dreams So Real release Gloryline. November: After a hard-fought and bitter campaign, Gwen Ingram O’Looney is elected CEO of the new unified Athens-Clarke County government, backed by a coalition of, among others, Athens musicians, club owners, and local scenesters. For the first time the local music community is perceived as players and potential spoilers in local politics. March: R.E.M. release Out of Time, which wins three Grammy Awards later that month. May: Out of Time becomes R.E.M.’s first number one album as it tops the Billboard charts. July: Widespread Panic release their self-titled second album. August: Local journalist and author Rodger Lyle Brown’s definitive history of the Athens music scene, Party Out of Bounds: The B-52’s, R.E.M., and the Kids Who Rocked Athens, Georgia, hits bookstores. September: The video for R.E.M.’s “Losing My Religion” wins six MTV Music Awards. June: The B-52’s release Good Stuff as a trio. March: Widespread Panic release Everyday. January: The B-52’s, reunited with Cindy Wilson, play The 40 Watt Club as a warm-up to playing a Super Bowl party held by Ted Turner and Jane Fonda in Atlanta. September: Widespread Panic release Ain’t Life Grand? October: R.E.M release Monster. In support of the album, R.E.M. perform the first single, “What’s the Frequency, Kenneth?” on David Letterman’s talk show, with guest vocals from news anchor Dan Rather, who had claimed he was attacked on the street by a crazed individual who asked him that very question, hence the title. The first Party Out of Bounds, an annual concert to benefit the AIDS Coalition of Northeast Georgia, is held in memory of Ricky Wilson. January: R.E.M. end a five-year hiatus on touring. It is an ill-fated tour — by August Michael Stipe, Mike Mills, and most seriously, Bill Berry (who suffers a brain aneurysm) will all have undergone surgery. April: Guadalcanal Diary play a reunion gig at The 40 Watt Club. Members of local band Kincaid put together a compilation album, consisting of tracks by a clique of bands who share a bright, poppy sound influenced by 60’s girl-groups and Brian Wilson of the Beach Boys, under the label name Kindercore Records. The compilation is a rousing success and Kindercore quickly becomes a premier outlet for the genre, exemplified by local bands like Olivia Tremor Control and Elf Power, members of a larger group of bands called the Elephant 6 Collective, as well as more eclectic acts like the band Japancakes. Athens can now boast a “third wave” of homegrown music. August: R.E.M. sign a new deal with Warner Bros. worth $80 million, the largest record contract in history. September: R.E.M release New Adventures in Hi-fi. February: Widespread Panic release Bombs & Butterflies. July: The Athens Music and Arts Festival, or AthFest, an annual celebration of local music combining an outdoor street fair with a nightclub crawl, makes its debut. October: Bill Berry resigns as R.E.M.’s drummer. April: Widespread Panic hold a free outdoor concert in downtown Athens to celebrate the release of their live album Light Fuse Get Away. It becomes the biggest CD-release event in rock history as over 60,000 fans from all over the country crowd the streets. May: The B-52’s release Time Capsule: Songs for a Future Generation, a greatest-hits collection. October: R.E.M., now a trio, release Up. November: Guadalcanal Diary release Guadalcanal Diary at Your Birthday Party. July: Widespread Panic release ‘Til the Medicine Takes. October: The B-52’s headline the annual Party Out of Bounds at the Athens Music Factory. November: Milos Forman’s film biography of Andy Kaufman, Man on the Moon, is released. The film’s title is taken from R.E.M.’s song, and Michael Stipe is an executive producer. May: Widespread Panic release live album Another Joyous Occasion. September: Nuci’s Space, a resource center for local musicians featuring practice rooms, equipment to loan, and counseling for musicians suffering from clinical depression, opens next door to the site where “the R.E.M. church” once stood. The center is widely praised both for its mission and as a reminder that the Athens music community is a community in the most literal sense. March: Love Tractor release their first album in 12 years, The Sky at Night. June: Widespread Panic release Don’t Tell the Band.